Al Jomaih and Shell Lubricating Oil Company (Josloc) in Saudi Arabia recently organised the first Turbine Week seminars in Al Khobar. The main objectives of these events were to launch the new Turbo S4 X and S4 GX turbine oils, as well as to announce the local blending of Turbo T and Turbo J oils for the power and petrochemical sectors in the kingdom. From high-temperature gas turbine systems to combined-cycle systems with integral gearing, the Shell Turbo range of turbine oils is designed to protect machinery from the effects of corrosion while minimising the build-up of deposits and lacquer in turbine bearings and control valves. The new Turbo S4 GX is specifically formulated to provide additional protection for gearboxes in that turbine systems require enhanced anti-wear performance from the oil, while the Turbo S4 X provides extended oil life along with enhanced efficiency. As for the Shell Turbo T and Turbo J oils, they are designed for industrial steam, light-duty gas turbines and turbo compressors. They provide reliable performance and protection while using mineral oil technology. Peter Morrey, product application specialist at Shell Global Solutions, conducted a technical presentation on Turbo T, Turbo J, Turbo S4 X, Turbo S4 Z, Turbo S4 GX, Morlina S2 and Diala S4 SX-I lubricants. During the presentation, he shed light on Shell’s leadership and gas-to-liquid technology (GTL), in addition to the features of the Turbo lubricants family and how it can provide outstanding oxidative stability while resisting the effects of water contamination. Moreover, a training session was held for the technical, sales and marketing teams, to inform them about the various applications of these oils. 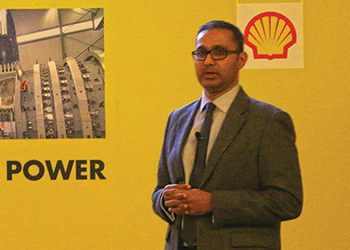 Commenting on the seminar, Khalid Yassine – B2B GM sales in Shell Saudi Arabia said: "Shell has topped the list of the world’s leading lubricants suppliers for the eight consecutive year running According to Kline. Such a record has been well earned, and is continuously reinforced by bold steps such as holding seminars, launching new turbine oils and announcing the local blending of others in internationally strategic markets like Saudi Arabia."